Is the e-voting honeymoon over? It's the holiday weekend, so today's (overdue) entry has perhaps less to do with computer security and crypto than usual. I'm interested in techniques for capturing the ambient sounds of places and environments. This kind of recording is something of a neglected stepchild in the commercial audio world, which is overwhelmingly focused on music, film soundtracks, and similarly "professional" applications. But field recording -- documenting the sounds of the world around us -- has a long and interesting history of its own, from the late Tony Schwartz's magnetic wire recordings of New York city street life in the the 40's and 50's to the stunning natural biophonies hunted down across the world by Bernie Krause. And the Internet has brought together small but often quite vibrant communities of wonderfully fanatic nature recordists and sound hunters. But we're definitely on the margins of the audio world here, specialized nerds even by the already very geeky standards of the AV club. We tend to take the unique sounds of places for granted, and we may not even notice when familiar soundscapes radically change or disappear out from under (or around) us. And in spite of the fact that high quality digital audio equipment is cheaper and more versatile than ever, hardly anyone thinks to use a recorder the way they might a digital camera. Ambient sound is, for most purposes, as ephemeral as it ever was. I commented last year in this space on the strange dearth of available recordings of David Byrne's Playing the Building audio installation; Flickr is loaded with photos of the space, but hardly any visitors thought to capture what it actually sounded like. And now, like so many other sounds, it's gone. Anyway, I've found that making good quality stereo field recordings carries its own challenges besides the obvious ones of finding interesting sounds and getting the right equipment to where they are. In particular, most research on, and commercial equipment for, stereo recording is focused (naturally enough) on serving the needs of the music industry. There the aim is to get a pleasing reproduction of a particular subject -- a musician, an orchestra, whatever -- that's located in a relatively small or at least identifiable space, usually indoors. "Ambience" in music recording has to do mainly with capturing the effect of the subject against the space. Any sounds originating from the local environment are usually considered nothing more than unwelcome noise, blemishes to be eliminated or masked from the finished product. 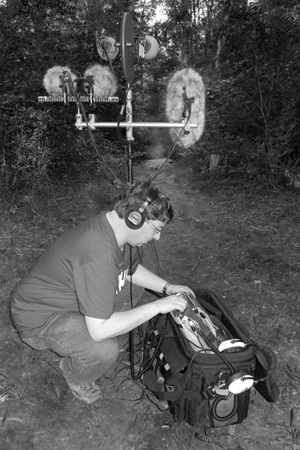 But the kind of field recording I'm interested in takes the opposite approach -- the environment is the subject. Most of the standard, well-studied stereo microphone configurations aren't optimized for capturing this. Instead, they're usually aiming to limit the "recording angle" to the slice where the music is coming from and to reduce the effects of everything else. There are some standard microphone arrangements that can work well for widely dispersed subjects, but most of the literature discusses them in the context of indoor music recording. It's hard to predict, without actually trying it, how a given technique can be expected to perform in a particular outdoor environment. If experience is the best teacher, it's pretty much the only one available here. Compounding the difficulty of learning how different microphone configurations perform outdoors is the surprising paucity of controlled examples of different techniques. There are plenty of terrific nature recordings available online, but people tend to distribute only their best results, and keep to themselves the duds recorded along the way. For the listener, that's surely for the best, of course, but it means that there are lamentably few examples of the same sources recorded simultaneously with different (and documented) techniques from which to learn and compare. And so I've slowly been experimenting with different stereo techniques and making my own simultaneous recordings in different outdoor environments. In doing this, I can see why similar examples aren't more common; making them involves hauling around more equipment, taking more notes, and spending more time in post-production than if the goal were simply to get a single best final cut. But the effort is paying off well for me, and perhaps others can benefit from my failures (and occasional successes). So I'm collecting and posting a few examples on this web page [link], which I will try to update with new recordings from time to time. But mostly, I'd like to encourage others to do the same; my individual effort is really quite pale in the grand scheme of things, limited as it is by my talent, equipment, and carrying capacity. My sample clips, for what they're worth, can be found at www.mattblaze.org/audio/soundscapes/.